Deep space image by the Hubble Space Telescope. The Hubble Space Telescope took this deep space image during a research program on star formation in very old and far away galaxies. Hubble's WFC3 (Wide Field Camera 3) was used and it illustrates the enormous gravitational effects of galaxy clusters. At the center of the image, gravitational lensing is clearly evident. 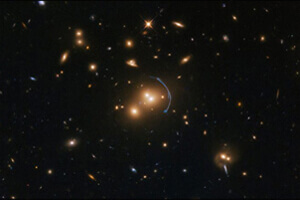 The lensing was caused by the galaxy cluster (a group of many galaxies) SDSS J1152+3313. From our perspective here on earth, we look toward SDSS J1152+3313. Its mass is so large that it bends light around it, causing the distortion seen at the center of this image. The objects behind SDSS J1152+3313 (from our perspective, here on Earth) are distorted. That's gravitational lensing. Gravitational lensing commonly takes the form of arcs, streaks, rings, blurring, and other odd shapes. This image gives astronomers important clues and insights into how stars were formed in the early and young Universe. The process of star forming, and understanding it, is important in astronomy and astrophysics. Anything that produces light in the universe is somehow connected to stars. Astronomers look to these young star-forming galaxies and learn a great deal about star formation. From this image astronomers can infer the size, formation rates and luminosity of many different types of stars. I love to write about the strange, unusual, and paranormal.